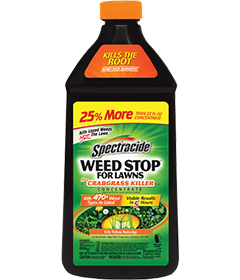 Use the Spectracide Weed Stop For Lawns Plus Crabgrass Killer Concentrate to kill over 470 types of weeds as listed, including crabgrass. The product produces visible results in 5 hours. This product kills broadleaf and troublesome grass weeds including dandelion, chickweed and clover as well as crabgrass, foxtail and yellow nutsedge, see product label for complete list of weed types. Apply when daytime temperatures are between 45°F and 90°F. Do not apply to Bermudagrass when daytime temperatures exceed 85°F. Do not apply this product in a way that will contact any person or pet, either directly or through drift. Keep people and pets out of the area during application. Do not allow people or pets to enter the treated area until sprays have dried. Do not exceed more than 0.375 lb Sulfentrazone/A per year. Do not treat when air temperatures exceed 90°F, as damage to grass may occur. Application at rates above speciﬁed on this label may cause injury to turfgrass. Do not apply this product to food crops (gardens and vegetables), forage crops or ornamental plants including ﬂowers, trees, shrubs, hedges, woody ornamentals, groundcovers established in landscape plantings and other non-target plants. Do not spray exposed roots of ornamentals and trees. 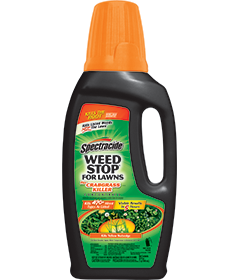 Do not use Spectracide® Weed Stop® Plus Crabgrass Killer Concentrate on lawns containing bentgrass, St. Augustinegrass, bahiagrass, centipedegrass or carpetgrass. Also, do not use on dichondra or lawns with desirable clovers or legumes. Do not use on vegetable gardens, fruits or ornamentals (ﬂowers, trees, groundcovers, hedges, landscape/ﬂower beds and shrubs). Cool season turfgrass: Kentucky bluegrass; perennial ryegrass; fescue spp., including tall, red and ﬁne leaf fescues. ***Application to Bermudagrass may cause temporary yellowing or discoloration, but full recovery can be expected. Do not apply to Bermudagrass when daytime temperatures exceed 90°F. SPRING: Spray when broadleaf weeds are young and actively growing with adequate soil moisture for best results. FALL: Spray when broadleaf weeds are young and actively growing with adequate soil moisture for best results. Fall applications will control weeds that may otherwise go dormant through the winter and resprout the following spring. For heavy grass weed pressure, apply a second application at the same rate, 14 days after the ﬁrst application. Spring and early summer: For the best results, apply this product from crabgrass emergence until the six-leaf stage (two tillers) or before the crabgrass is 3 to 4 inches tall. This period begins the ﬁrst time that you can see crabgrass in your lawn. Use two applications at the same rate with a 14-day interval for dense populations. The maximum application rate is 6.5 fl oz of product per 1,000 sq ft per application (0.6 lb 2,4-D acid equivalent per acre per application). To treat small areas or individual weeds, use a pressure sprayer for better control. Do not use a hose-end sprayer for spot treatments. Mix the indicated amount of product listed below with 1 gal of water for each 500 sq ft to be treated. Shake well before spraying. Spray the target weeds thoroughly. Nozzle adjustments may be necessary to deliver small spray droplets on the target weeds for uniform coverage. Amount of product to be diluted in 1 gal water required to treat 500 sq ft of lawn with pressure sprayers. Calculate the total lawn area to be treated. This is done by multiply the length of the area by the width to obtain total square feet. Prepare enough spray solution to treat the area calculated. Prepare the spray mixture according to Table 1. Carefully measure the proper amount of product to treat 1,000 sq ft. If more or less than 1,000 sq ft is to be treated, adjust the amount of product as shown in Table 1. Shake the spray solution before and during application. Use a spray pattern that gives small droplets without any fine mist. Table 1. Amount of product to treat 1,000 sq ft of lawn with pressure sprayers. From Table 2 below, determine amount of product to be applied for each 1,000 sq ft of lawn. Fill sprayer jar with enough concentrate to cover the total area to be treated. DO NOT add water to the sprayer jar. Set dial on sprayer to the “Rate per Gallon” setting shown in Table 2 below. Table 2. Application rates for turfgrass with hose-end sprayers. ∞This assumes the sprayer delivers approximately 2.5 gal per 1,000 sq ft sprayed. Example for Kentucky bluegrass: To treat 3,000 sq ft of lawn, measure 20 fl oz of product into sprayer jar. Do not add water. Set dial on 5 Tbsp or 15 tsp and apply uniformly on 3,000 sq ft of turfgrass. Check the directions you received when you purchased your sprayer for further details on the proper use of your dial sprayer. Directions are calculated assuming hose-end sprayer is used to spray about 2 gal of water/product mixture per 1,000 sq ft.
From Table 3 below, determine amount of product to be applied for each 1,000 sq ft of lawn. Pour product into sprayer jar to the required “ﬂ oz” level. Add the appropriate amount of water to the "gallons" level. Replace sprayer top on jar and shake well before spraying. Example for Kentucky bluegrass: To treat 3,750 sq ft of lawn, pour 24 ﬂ oz of product into sprayer jar. Add water to the 9 gal mark and apply uniformly on 3,750 sq ft of turfgrass. Check the directions you received when you purchased your sprayer for further details on the proper use of your sprayer. For newly seeded areas: Do not apply within four weeks after seedling emergence of Kentucky bluegrass, ﬁne fescue blends and perennial ryegrass. Apply this product to newly seeded grasses when well-established (approximately six weeks after seedling emergence) or after the third mowing. Mowing: Delay mowing two days before and until two days after the application of this product. Additional stress from low mowing heights may increase the possibility of turf injury. Clippings from the ﬁrst three mowings should be left on the treated area. Do not use clippings from the treated areas as mulch or compost around ﬂowers, ornamentals or trees or in vegetable gardens. Pesticide Disposal and Container Handling: Nonreﬁllable container. Do not reuse or reﬁll this container. If empty: Place in trash or offer for recycling if available. If partly filled: Call your local solid waste agency for disposal instructions. Never place unused product down any indoor or outdoor drain.